Trivia: Since spiders really aren't a trainable type of animal, the filmmakers used hairdryers to blow on them, in order to get them to move correctly. 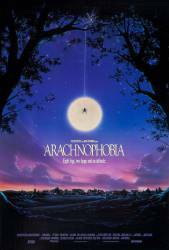 Trivia: Near the start of the film, when Atherton is examining the spider after returning from the valley, several butterflies are seen pinned up in front of him. Several of these are not South American butterflies - the top left one (blue with long tails) is Papilio Ulysses, a species of tropical Australia, and the big green-and-black one near the bottom right is Ornithoptera priamus or O. euphorion. Whether this qualifies as a mistake, I don't know - Atherton is supposed to be an expert, so they may not be the most geographically accurate 'colourful' butterflies to use. Dr. Ross Jennings: Not the Chateau. Delbert McClintock: Rock and roll. Question: Are the small spiders in the movie an actual type of spider? If so, what are they called? Chosen answer: The small spiders are Avondale spiders from New Zealand. They are totally harmless to humans.